You know, I’ve stayed places where trains are so close they blow you out of bed when they roll by…… whistle shrieking again and again, building shaking…….then again, they can be just far enough away that the whistle softly brings you back to a childhood dream, that reassuring distant low rumble rhythmically lulling you off to a deep sleep. That’s just how far the Brewster House is from the Downeaster, tracks just north of the Freeport Station, on it’s way to the last stop in Brunswick….sort of a natural sleeping potion…. It’s been a crazy, busy month for the new innkeepers, but we’re getting into a rythym, with two recent rave reviews on TripAdvisor and our five circle rating from same for 2013. Of course, Scott and Ruth Thomas are largely to thank for the latter, but we’re just as keen on keeping our guest experience superb and the house comfortable and breakfasts, to die for! Read the reviews if you don’t believe me! But back to the subject I started with, the Downeaster is becoming a very popular way to catch a quick stress-free dose of Freeport. Recently Jeremy and Melissa came to us from Texas via the Logan and the Downeaster, and they had a bang-up time in Freeport. They helped us understand the need to create that pick-up/ drop-off link to the station in town (maybe 2,000’). Of course, it’s where it’s busy, we’re where it’s quiet, yet only 3 blocks from shopping, restaurants and all that Freeport has to offer. The train leaves North Station (under The Garden) at 9:05 AM and 5:00 PM both weekdays and weekends, arriving here at just after noon, or just after 8PM. Boarding is also possible in Woburn or Haverhill, MA, or beyond in Exeter, Durham or Dover, NH. You can have us pick you and your, bags up (check in isn’t till 3PM), then head back to town to do your thing. 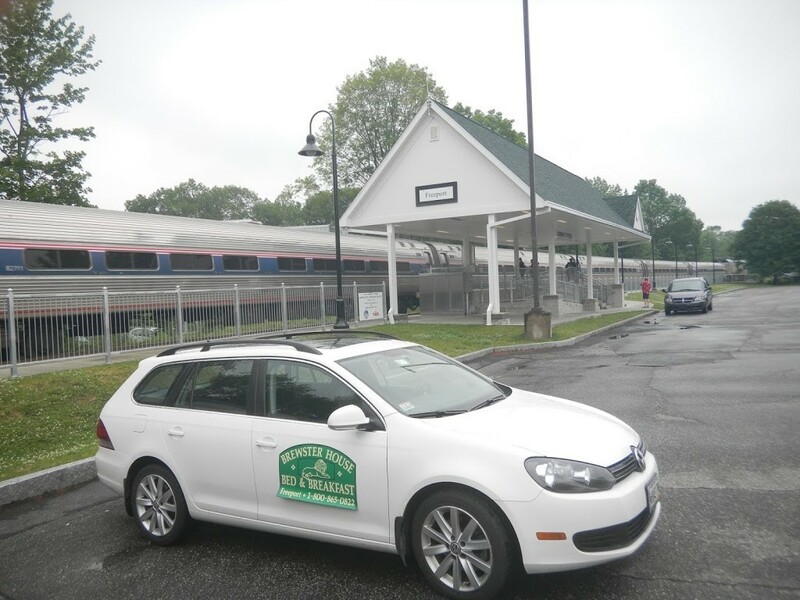 Likewise, we can drop you off for the evening train back to Boston (7PM weekdays, 6:05 weekends). The round trip is less than $30!! No tolls, no fighting traffic……and YOU CAN ARRANGE TO BRING YOUR BIKE ON THE TRAIN! !